Mens sana in corpore sano… and the best way to do so is practising adventure sports in the Ebro Delta. Thanks to its extraordinary location in the Ebro Delta, Deltebre offers you the most beautiful landscapes to disconnect from the world and enjoy extreme sports. 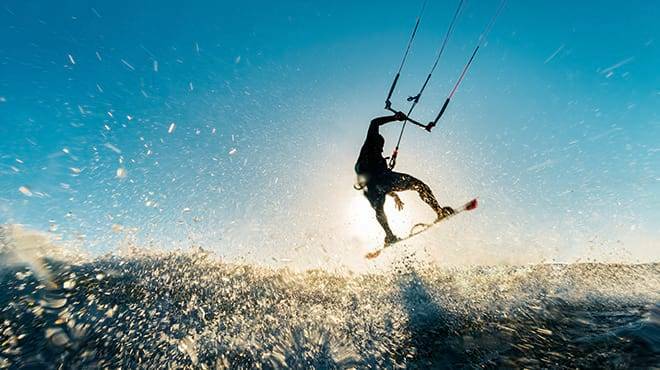 Kitesurfing, kayaking, triathlons, sailing, night walks… Feel the adrenaline rush! Even if you are on holiday, you will actually feel a crazy need to do some exercise but just because it will be the perfect opportunity to enjoy the most calming scenery. Take the opportunity to walk along the river bank or the seashore or enjoy different water sports. If you like both sports and nature, this is your opportunity! The Garxal Desert Race is an 8 km race that combines sand circuit and road surface. The race takes place in the area of El Garxal, in the river mouth of the Ebro River. An epic race in an amazing place! More information. A night walk that goes through the recognised Ebro nature trail GR-99 from Fontibre (Cantabria) to Deltebre, with a total of 1,200 km and 42 stages. You can choose between the long route (18 km) and the short one (9 km). More information. Deltebre becomes the stage of the Trilimit triathlon each year. This sports event brings together more than 650 athletes from the zone. During a weekend, Deltebre is the capital of the triathlon in Catalonia. More information. Enjoy running in nature and break the monotony of the urban routes. The land of Deltebre offers you a wide range of itineraries depending on your physical condition. And if you desire, you can make the same cycling tours. If you like sports, get ready to run through paths in open spaces next to rice fields, dunes, lagoons, the river… Meet again with yourself and with nature! Are you a lover of the wind, the sea and the salty air? Did you know that in Deltebre we have one of the best winds to practice kitesurf? In addition, we have a unique landscape. So you will not only be at ease in the sea, but you will also experience unique sensations once you are on land. You will relax in our beaches with natural dunes. If you do not have your own kitesurf equipment, you can rent it in the town. More information. Are you a lover of the wind, the sea and the salty air? Did you know that in Deltebre we have one of the best airs to practice kitesurf? And in addition, we have a unique landscape. So you will not only be at ease in the sea, but you will also experience unique sensations once you are on land. You will relax in our beaches with natural dunes. If you do not have your own kitesurf equipment, you can rent it in the town. More information. Sports practise is not limited to extreme sports. The Ebro Delta is one of the most important fishing sites in the Mediterranean. You can practice several techniques and find a great variety of species in its shoreline. Every year, Deltebre hosts one of the rowing competitions framed in the Catalan rowing league. All the rowing teams in Catalonia participate in this event. Deltebre also has a rowing team, A.E. Xino-Xano. The ‘llagut català’ is a boat that was created in Terres de l’Ebre as a fishing tool in the Ebro Delta.